Friends, family and fans are always chasing advice on how to cut out processed food from their diet, but feel a bit lost and are not sure where to start. 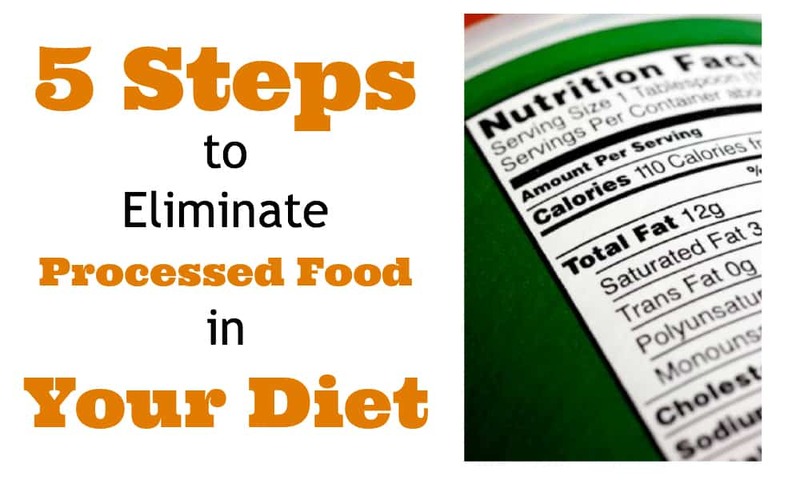 So what I thought I would do is take you through 5 steps that I took to eliminate processed food from my family’s home. The key to my success was to make small changes, not some drastic purge of every item of food in your fridge and cupboard, don’t adopt an all or nothing mentality. What you will find is that consistent small changes over time, will lead to a drastic change over the long term and in turn become a way of life as it has for myself and my family. My general rule of thumb when it comes to the ingredients listed is, if I can’t pronounce it, I don’t eat it. Go to your pantry as soon as you finish reading this article and start reading some labels, I bet (like I was) that you will be shocked by what you are eating. I also downloaded myself an app called Additive Alert (there are a few out there). This app allows me to look up the numbers that are listed in the ingredients. Once you start reading what some of the numbers actually represent I bet you will actually throw the product in the bin, I know I did. Other things to keep in mind are things like, how many ingredients are on the list? Could you find the ingredients separately and make the item yourself? and which ingredients are a refined sugar or sweetener. Like most, wheat based products formed a large part of my diet growing up. So many common grocery items are made with wheat in things like sandwich bread, pasta, crackers, rice, breadcrumbs, hamburger buns, etc. Not only are they common, but they are usually cheap, convenient and terrible for your body. Instead start looking for wheat alternatives that you can use such as, zucchini spaghetti, almond flour, and coconut flour. Followers of my site will know that I have very little dairy in my diet as it doesn’t agree with my body, but when I do I always opt for the organic option (Carol’s note ~ Grass fed or raw dairy are excellent choses too). When it comes to buying dairy products you just cannot peel or wash off your milk like you can your produce so it is best to go organic. Just one of many great reasons to avoid conventional dairy products from animals that have been treated with antibiotics and hormones (not to mention their diet and living conditions ñ you are what you eat eats, too)! I say preferably organic as cost is a factor when it comes to buying 100% organic. If you haven’t been a big fan of vegetables in the past I urge you to start trying. I’m not talking about sitting down to a plate of Brussel sprouts for dinner or eating an apple a day, I’m talking about trying some new recipes, make a vegetable or fruit salad, heck you can even make vegetable salad with fruit in it (crazy idea I know). Another great tip is if you can’t afford organic, you can soak you fruit and veggies in a tub of water and 1 tablespoon of apple cider vinegar for 20 mins. What happens is the wax and pesticides are removed from the fruit and veggies, you can really tell because the water goes brown. After soaking them simply rinse them off and you’re all set, and no they don’t taste like vinegar after this process. As a parent it’s completely up to you how much real food your kids eat, after all they can’t drive themselves to McDonalds to buy a Happy Meal. If your kids are fussy about eating their vegetables, do what I do, hide them in their meal. My spaghetti mince always has grated carrot and zucchini in it, I also never make meatballs without doing the same. You need to make food fun for your kids, Ronald McDonald has been doing it for years (the fun part, not the unprocessed part). Get them involved in making the food, you will be surprised how much more they like the food when they have actually been involved in making it. So what are you waiting for, everyone walk to your cupboard and go through step one. Awareness of what is in the food you eat is the first step towards making a change. Commit to step one, then start incorporating other steps. Before you know it you will be on the path to eating unprocessed foods and best of all you will start feeling better for it, guaranteed. Let me know in the comments below what do you plan on doing during the next week to reduce your familyís consumption of highly processed foods? About the Author: Dan Nikas is the owner and founder of No Excuse Fitness. Dan is extremely passionate about getting out and helping people on their health and fitness journey, his site No excuse fitness is a unique fitness blog in that it shows and highlights ways for busy people to eat well and exercise, whilst still having a life. Don’t use excuses.